Being able to get out to see all the fall colors is a special time of year that never seems to last long enough. 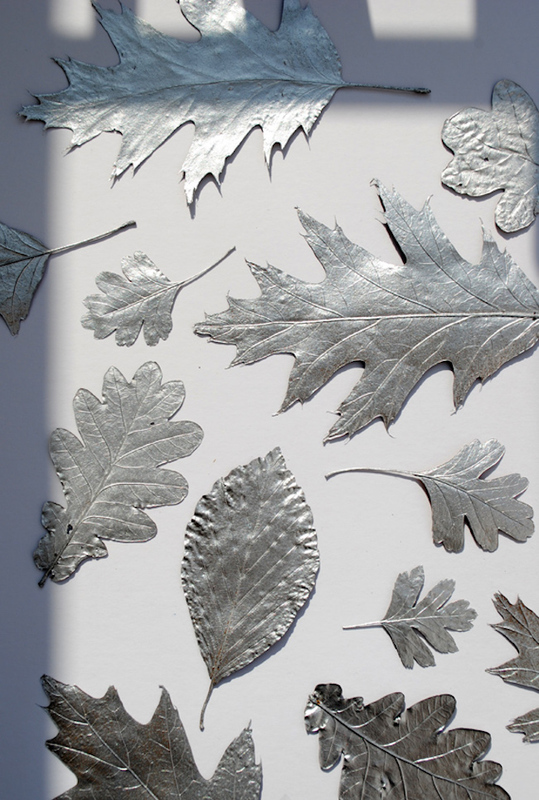 You can pick a few leaves off the ground and press them in books to try and preserve them, but what are you supposed to do with them after that? 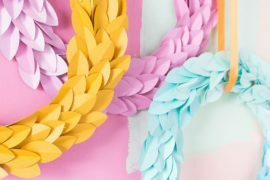 You’ll know the answer to that after you have a look through these crafty DIY ideas that will give you lots of inspiration for decorating your walls with some of those leaves you saved! 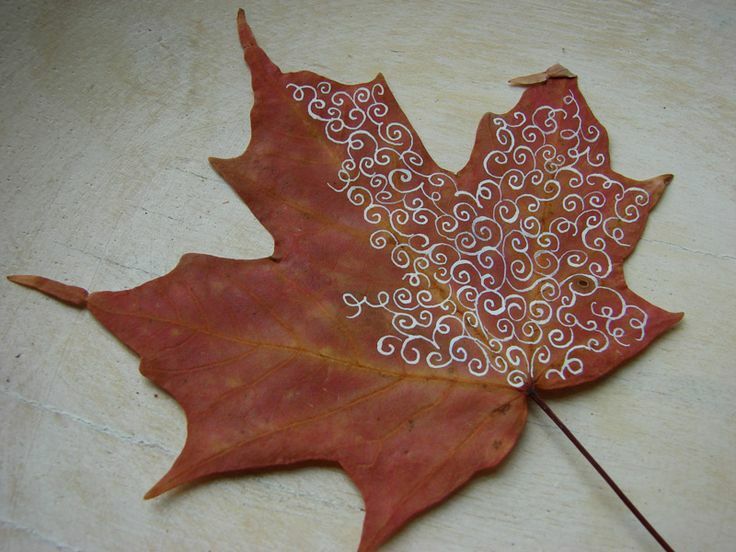 Fall leaves already look beautiful on their own, but you can enhance their look and turn them into real works of art by using some light-colored markers from any craft store to doodle different designs on them. 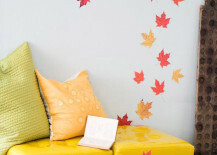 It’s also a great project to get kids involved with! 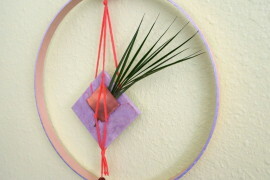 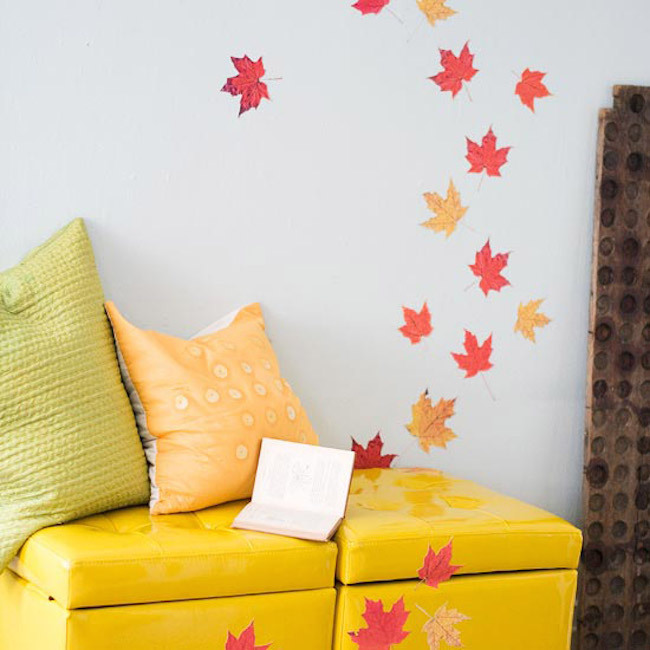 Here are some creative ideas from Artful Parent and Inner Child Fun. 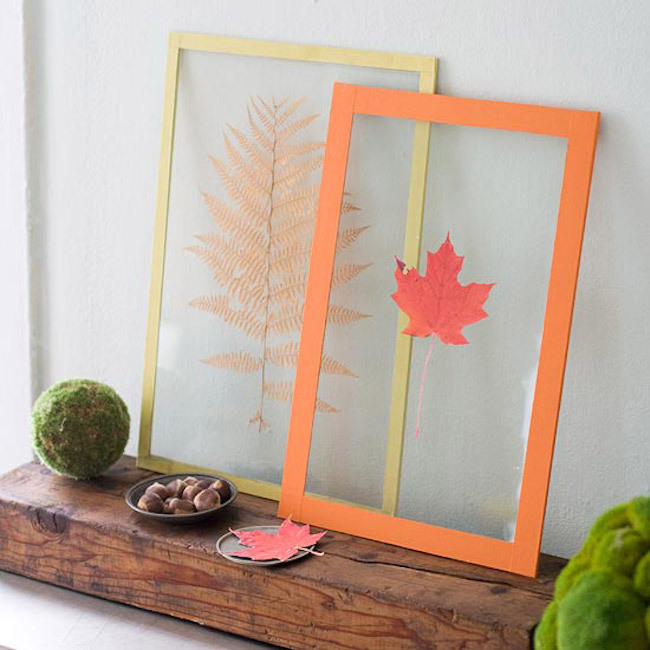 To really highlight the bright colors and natural textures of your pressed leaves, you can keep them pressed between two pieces of clear plastic or glass, and then frame them. 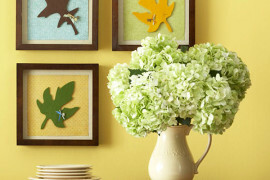 Here are a couple of examples from BHG. 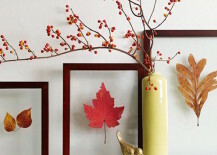 If you have a sizeable section of a wall that could use a little love for the fall season, you can go all out by either attaching leaves directly to the wall (and even furniture) like this first idea featured on BHG, or by simply framing a bunch of them and hanging them on your wall in a large grid — like this second example from Babble. 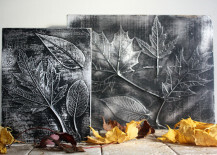 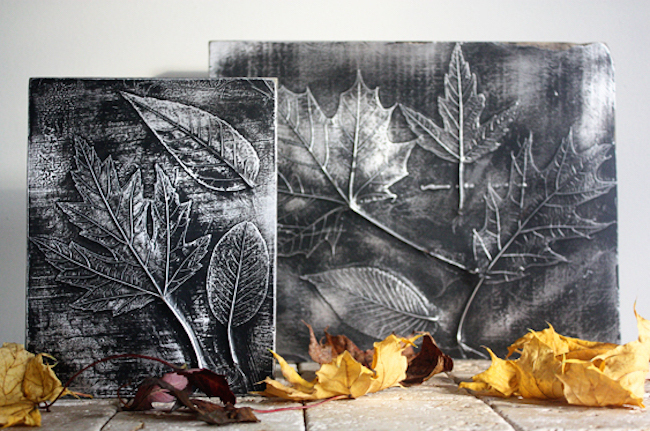 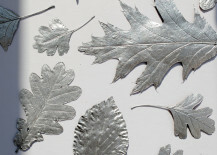 You can get really crafty with this amazing leaf relief project for a metallic or fossilized look. 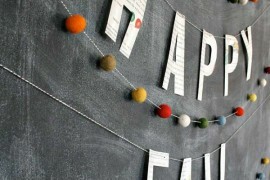 Cassie Stephens and My Baking Addiction will show you how to do it! 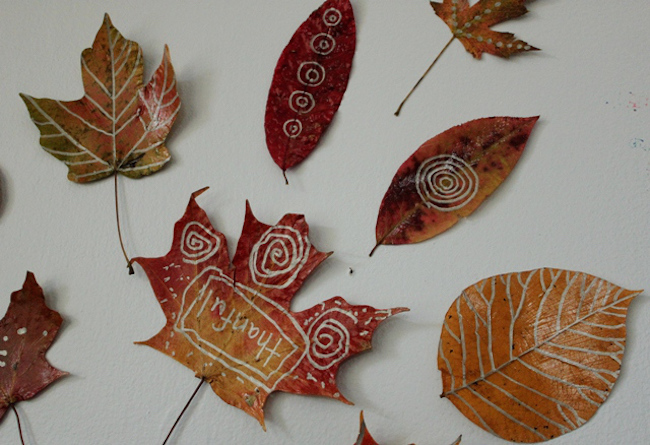 Once we get a little closer to the holidays, this leaf project may be more appropriate than leaving your leaves naturally colored. 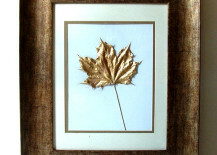 Simply spray paint your leaves in gold or silver for a gorgeous yet simple holiday look. 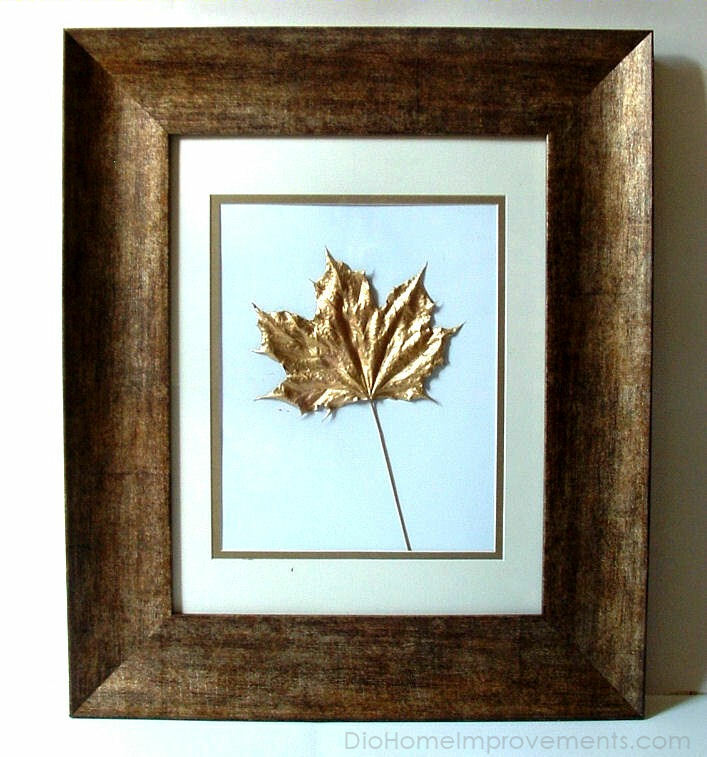 Dio Home Improvements pairs a gold leaf with a gold frame, while Minie Co. features a bunch of different silver leaves that look just stunning on their own. 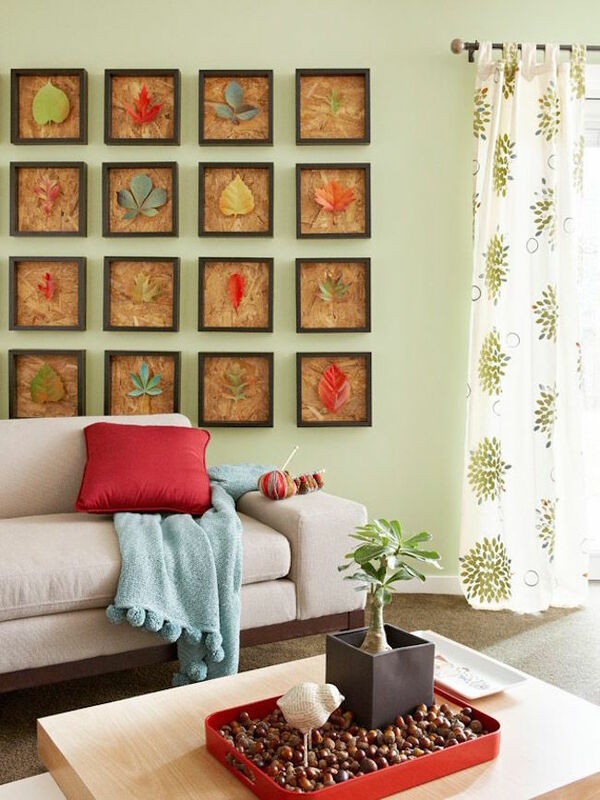 If you already have lots of framed art in your home, you can swap out the photo for a simple pressed leaf and plain piece of brown paper. 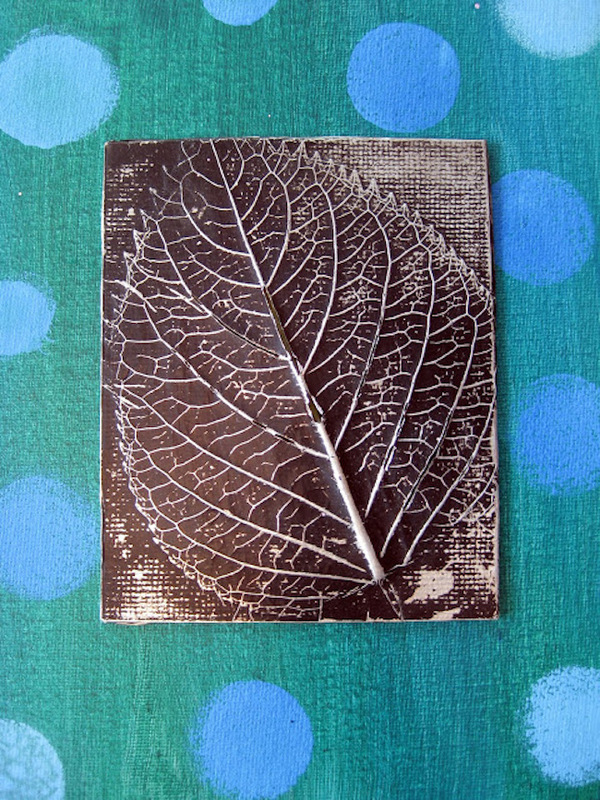 Check out this collection of photos from Wit and Whistle that shows you how to do just that! 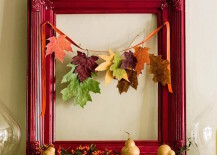 Or for a slightly different look, you can combine a frame with a garland of leaves — like this colorfully creative example from BHG. 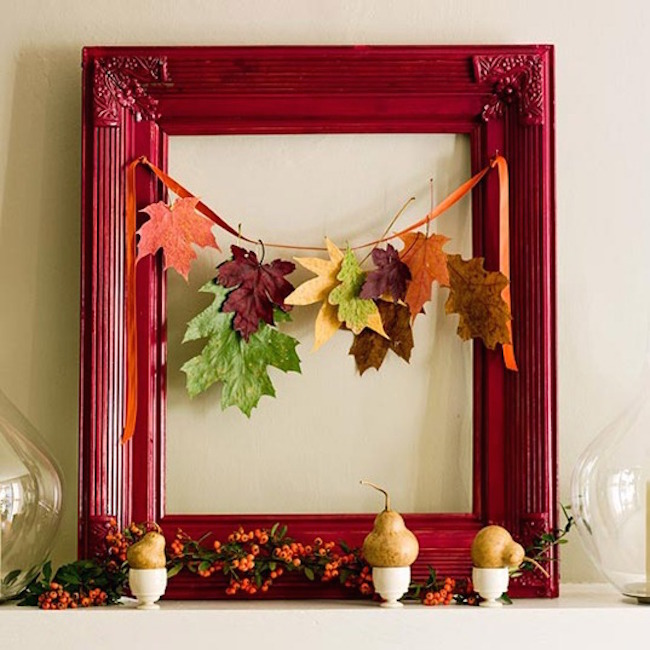 The framed garland shown above is a cute idea, but if you want to go bigger, you can spray your leaves with an acrylic sealer and hang them from a string by their stems. 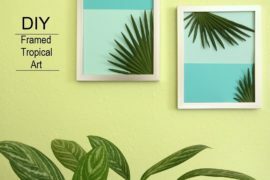 Check out the photo collection below! 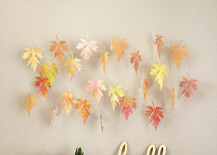 Alternatively, you could even cut out pieces of paper instead as a banner and attach leaves to them. 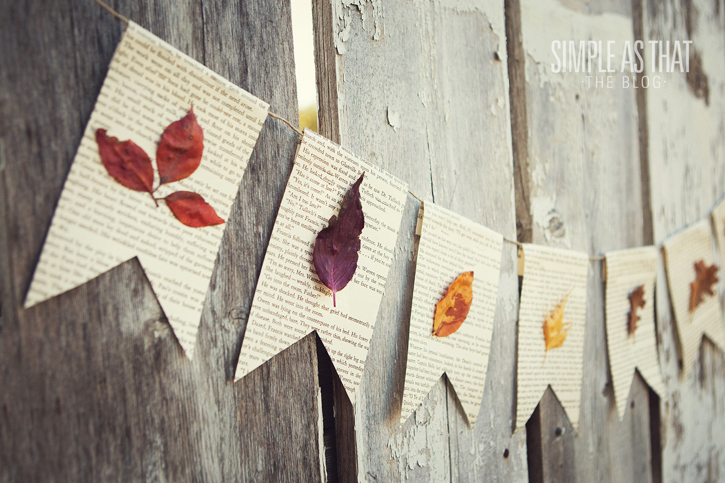 This idea from Simple As That uses pages from books as the banner paper. 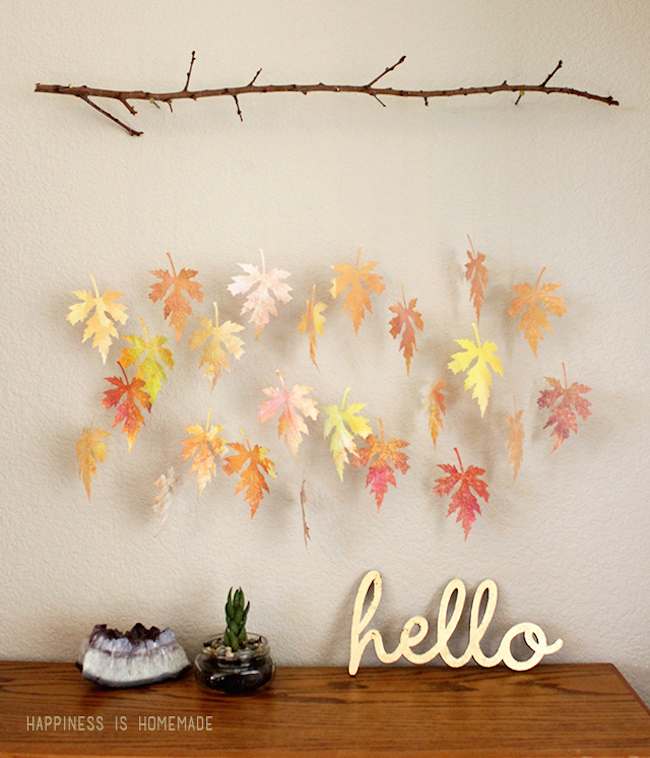 Finally, you have to check out this lovely little fall leaf mobile from Happiness Is Homemade. 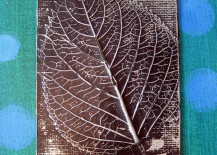 Although the leaves in the photo below are made from paper and watercolor, you could still very well do this with real pressed leaves! 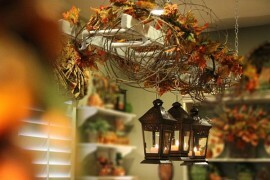 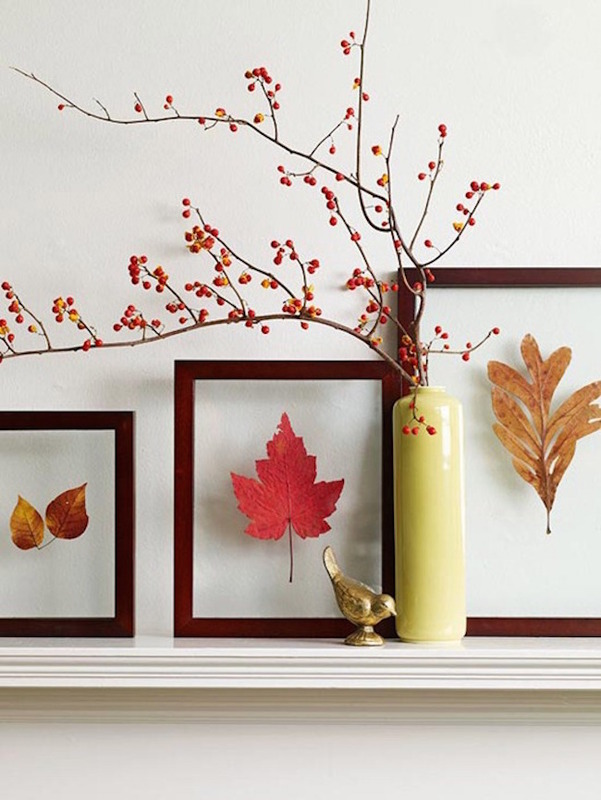 What’s your favorite way to decorate your home with fall leaves? 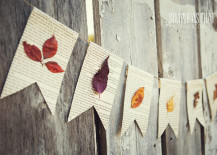 Leave a comment to let us know!